While we at K9 & You have successfully been training dogs for a little more than a year, we’ve been passionate about proper dog training for more than a decade. From the newest puppies who need to learn where to go potty, to the oldest rescues who haven’t quite learned obedience cues, we work with all types of dogs. 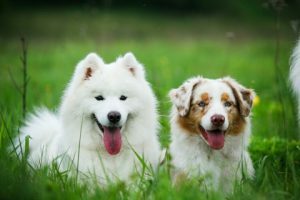 No matter how young, old, little, humongous, energetic, or lazy your dog might be, we promise to help the two of you strengthen your bond while mastering behavior expectations along the way. At the end of the day, our goal is to provide the necessary tools owners need to set their dogs up for success. Our fun and friendly atmosphere allows everyone to relax, while our methods and passion for teaching will help you and your dog feel more confident as you leave our sessions. When you’re out in the world with your dog and he runs off, you need to feel confident he’ll come back. We help you build a bond where the dog not only comes back to you, but wants to come back to you. Contact us today to learn more about our available classes and pricing. Our staff is ready to help you select the course that will strengthen the bond between you and your furry friend while learning important skills along the way. We’ll see you and your dog in class!